Named one of TIME Magazine's Top 25 International Leaders of Tomorrow (TOMORROW 25) and one of the World's Top 5 Young Entrepreneurs by Entrepreneurs' Organization, Daniel Fine has made headlines for being a student entrepreneur who gets things done. 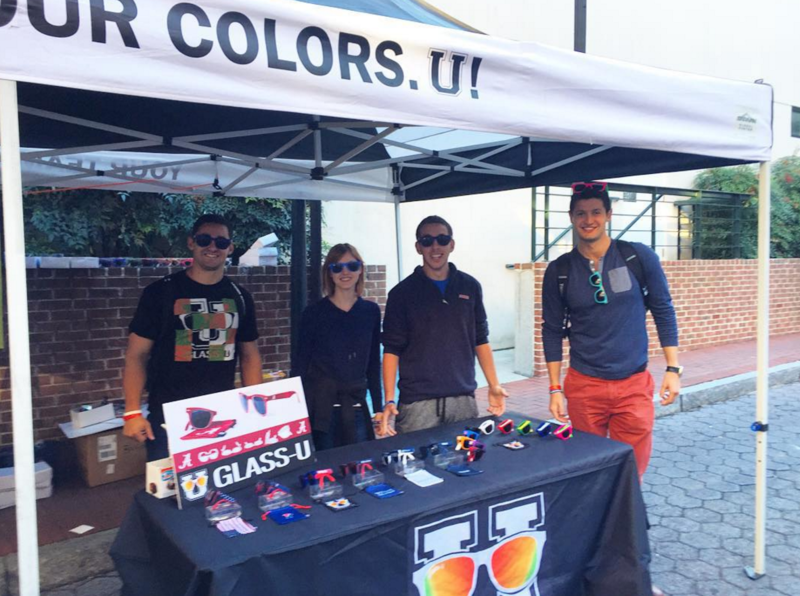 His current company GlassU, which makes fully folding sunglasses, is licensed to hundreds of universities and has been featured at events ranging from the Rose Bowl to the FIFA World Cup. Daniel is one of the most impressive student entrepreneurs I've met so far (He recently graduated last May 2015 from the University of Pennsylvania's Wharton School of Business but my first interview with him once done before he graduated). Yet what makes him really special is the energy he carries with him. Daniel has clearly made the most out of his stay in college. It was cool seeing him interact with almost every single person who walked into the HubBub coffee shop where we had our interview in. It's just hard not to get along with Daniel. Fun fact? He always has multiple GlassU sunglasses with him whether it's in his pocket or his bag. Having recently graduated from college last May, Daniel has gone on to work on GlassU fulltime, focusing on building national and international partnerships. I got to chat with Daniel on how everything started, his college experience, what he has learned and memorable moments along the way. One thing Daniel emphasized during his interview was how everything he's done in the past decade can all be traced to one moment--his younger brother Jake Fine getting diagnosed with diabetes when he was 11 years old. It was that moment that drove Daniel to start his first initiative, Team Brotherly Love, a non-profit organization with the goal of raising money for diabetes research. Hand in hand with his brother's help, Team Brotherly Love has raised over $2 million towards their goal. Daniel recalls selling apparels for lacrosse players in their "Lacrosse Against Diabetes" campaign. This was Daniel's first experience in sourcing products from factories. There would be many more to come. After seeing how high the margins could be when you sourced your products from factories then sold them, Daniel decided to launch another company called Fine Prints that sold products and merchandise to schools in the East Coast. This would subsequently be followed by another venture the summer before Daniel's freshman year in college called NextTutor, now called Match Tutors. Daniel shared, "Those are probably the two most important things that if anybody has they'll be able to achieve something. You need the passion and the drive in order to achieve something. Early on, you can create things without being incredibly passionate about it but you can't consistently create things without being passionate about it." He added, "Focus is probably the next thing by a very very close shot. The focus and drive overlap are two things that are just so necessary for you to be able to create what you're shooting for. This is something I struggled with in running a company, trying to balance being a student, running companies, being an athlete and being part of a fraternity." Daniel admits up to now he still has FOMO (short for 'fear of missing out') and has a hard time striking the balance. He recalls the time he represented the US at the G20 Summit in Moscow then flew to New York right after to catch a friend's birthday party. He shared, "I think a big part of being able to continuously balance everything is the taste of success. Once you start to feel and understand what you can achieve, that taste of success can drive you so hard because it feels good that as you get that consistently, you realize that nothing can get in the way of your dreams." With Daniel having just graduated last May, I took the opportunity to ask him about his college life and how he has changed throughout the four years. He shared, "Honestly everything. I honestly carry myself in a different manner. I learned a tremendous amount how to lead and manage people. I have failed so many times. I literally failed so many times. Probably almost every single day, there's some sort of failure." While Daniel made sure to clarify that failure doesn't just mean your company died. He shared examples of failures when he missed responding to an email, or being unable to seal a deal with a customer that could have been a 5 figure sale. He added, "These are horrendous lessons but you learn the hard way. I've failed in terms of how I've led people. For example, last summer, we had a team of probably 26 people but a lot of them were really acting as tasks managers to the admin team and myself. But that doesn't work. It doesn't motivate people. They were there and they were bored and suddenly there was more work for me thinking about what to make them do." From this experience Daniel learned how to empower his employees and interns by giving them something they can own and be passionate about. He shared, "I give them a project that they're excited about then tell them, 'only come to me when you really have questions but I'm trusting you do this and you've got this power'. With this strategy, they love it and now it's a win for them, a win for me and a win for the company." Daniel is one of the biggest believers in college. He is against this whole notion of students dropping out and truly believes in the value of college. He shared, "For me, that (dropping out) was never a huge question. First, I'm fortunate to be at Penn and Wharton where a degree can be so valuable and not having that would be a disservice to myself in the long term when I have that opportunity right in front of me. Second, I'm a pretty normal social guy. 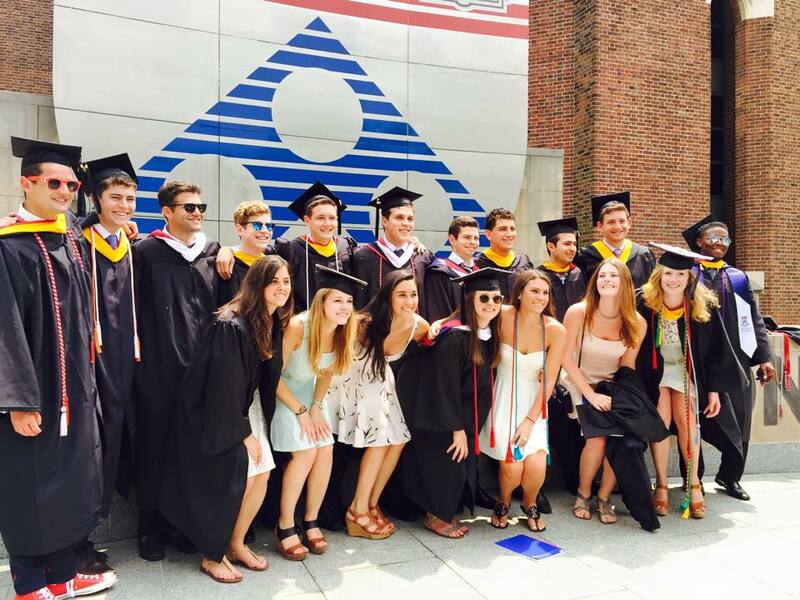 I didn't want to leave my friends and my core group of friends here at Penn." He added, "It's not just about what you take away from being an academic but how you grow from being a person from your own cohort form your peer group of thousands of others. You learn from the people, you learn from the social sphere." Feeling a bit nostalgic when I asked him about his favorite memories at Penn, Daniel took me down memory lane to the very first time he found out that he had made it to Penn. Daniel was in his Spanish class when he got the email that he had made it to Penn. He was a recruited athlete and had spoken to his coach about it but for him, it was only official when he received the email. That would be the start of so many more memories. He added, "From fraternity rush freshman year and meeting new friends to coming to spring fling... I guess some of the coolest ones on a daily basis, when I see people wearing my product, the sense of pride from that is extraordinary. The first frat parties--they were a ton of fun. The sports. There's a bunch of it. I guess the press has always been usually nice as well." Continuing on to the professional side of things, Daniel recalls getting a call from the head of the US delegation for the G20 entrepreneurship summit in Moscow after he placed second in the Global Student Entrepreneurship Awards. He recalls, "I was 20 and I was by far the youngest person in a 400 person delegation. That was just an extraordinary experience." He also enjoyed being one of the clients for Wharton's Management 100 class, where students work in teams on a project for a client's business or organization. Daniel shared, "People can tell you you're doing a good job and they enjoy what you're doing but it really means something else when a lot of the kids who are in my classes and teams in Management 100 actually ask to intern with us following the course." Daniel shared a few of the lessons he has learned in the last decade. He said, "Optimize your time. Do what you're supposed to be doing when you're doing it. Mess around less. Know who your peeps are. Your best friends will care about you and respect what you're doing. Understand that most people don't care but that's okay. Don't be afraid to follow your dreams." He also recalled the days when GlassU was just starting and he $20,000 went down the drain because the first batch of glasses he ordered would snap in the middle. He shared, "I was 18 years old and that was money I had made and I was like, oh crap what do I do and you just have to keep hustling." And indeed, Daniel's hustling has gotten him partnerships with the likes of the Rosebowl and just last year, the FIFA World Cup. He shared a few tips on securing partnerships, "You have to understand what people are looking for and what they're shooting for and you have to also understand what your goals are. For us, we're an interesting kind because when we go into partnership, our product becomes a multiproduct and cobranded thing. We're not a random company just trying to sell our own company and swag." Given this, Daniel highlighted the importance of being clear in negotiations and having an outline and getting things on paper. Along the way, Daniel has gotten the opportunity to meet some incredible people. He shared, "That's probably one of the most exciting parts in the last few years. The exposure and the access to people that I've met ranging from high school kids that I mentor now that reached out just to talk and I look at as little siblings up to CEOs of Fortune 500 companies." Daniel emphasized how graduation means game time. He shared, "The focus is scale. We have built an incredible licensing company and we've brought in a bunch of people who are exceptional in their spheres and realms of expertise. Bringing them on and focusing on bringing our brains together. It's go time." Daniel mentioned integrating a mobile retail product and expanding to other customizable products as well. Daniel is also looking forward to expanding and hiring extensively, both locally and internationally. In terms of long term plans and dreams, Daniel hopes to build the Fine companies into something like the Virgin group. He shared, "And I want to change the world and do so through these dreams and businesses and people around me now and the people who will come and work with me in the future." Learn more about GlassU here. AUTHOR'S NOTE & UPDATE: The first interview was done in May before Daniel graduated but I had a follow-up interview with him recently this past October when he visited Penn. 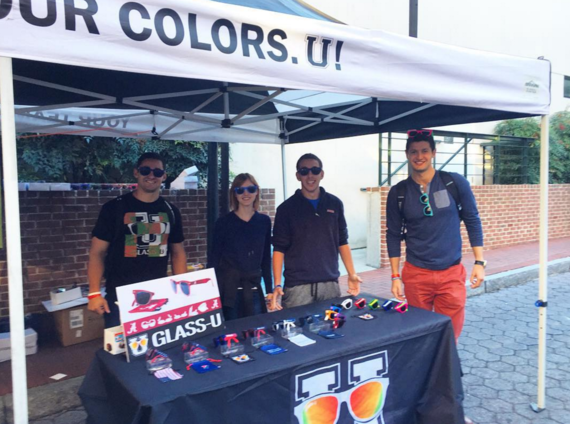 Since graduating Penn, Daniel has focused on growing GlassU's partnerships and licensing gigs both nationally and internationally. David Ongchoco is a student entrepreneur and avid storyteller from the Philippines studying at the University of Pennsylvania majoring in what he likes to call, LIFE. He is currently working on expanding his for-purpose organization YouthHack. It's David's goal to make an impact in the lives of as many people possible while constantly learning new things every single day. If you have any interesting startup stories, David can be reached via Twitter @DOitChoco. You can also email him at david@youthhack.net.